Friday through Sunday, September 27-29, 2019. Offsite. Reconnect with wonder and magic while building trust and intimacy with your Heritage Sisters. You are invited to join your fellow Heritage sisters to celebrate life, friendship, and sisterhood. 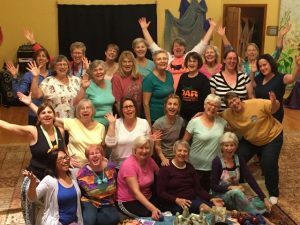 If you identify as an adult woman of Heritage Universalist Unitarian Church over the age of 18, you are encouraged to take time out with the women of Heritage to nurture our spiritual selves, our friendships, and our bond as women. Spiritual exercises and workshops, crafts, amazing food, intimate discussion groups, nature hikes and more make this a weekend about connecting. There is also time for self-reflection and rejuvenation on your own time – do what meets your needs! Shelly Graff will join us again this year to lend her special guidance. Location: Hope Springs Institute, near Peebles, Ohio – About an hour from church. Cost: $270 includes room, board, activities and all meals from dinner Friday through lunch Sunday. The retreat center is open to Heritage women from 1 p.m. Friday through 4 p.m. Sunday. You may come as your schedule allows; however, the price is the same no matter how many yummy, delicious meals you miss! We’d recommend arriving by 6:30 p.m. on Friday night. If you can’t make it by then, let us know and we can save a meal for you. Roommates: Often, it can seem daunting to attend a weekend like this if you’re new to Heritage or have never attended before. Know that if you need to find a roommate for the retreat, we will help in any way we can! You can talk with Julie Kane for more information. Make checks payable to HUUC. Planning: Hope Springs is the bomb when it comes to food. Meals are sumptuous and all dietary needs can be met. Most bedrooms are double occupancy, with some offering three beds including en-suite bathrooms. Other arrangements are available including a rustic teepee, cots and tent camping. (see Joelle for advice!) All accommodations are the same price. Hope Springs is alcohol-free and handicapped accessible. For more information, contact Joelle Tunning at 513-703-8205 or visit www.hopespringsinstitute.org. Registration Form: You can download and fill out a Women’s Retreat Registration Form.